← Nokia should give up on Symbian? We had the launch of the Nokia N8, officially the first device to support Flash Lite 4.0. Besides the Nokia N8, we also have a Nokia C7 and Nokia E7, all running the Symbian^3 and Adobe Flash Lite 4.0 is already installed. This implies the possibility of developing applications for Symbian^3 using ActionScript 3.0 running on the browser or standalone. Flash Lite supports some features partially. Flash Lite adds some features to work specifically with mobile devices. Also see partially supported classes and the Unsupported classes. Come to our first example using the new capabilities of Flash Lite 4.0, in which case the accelerometer. 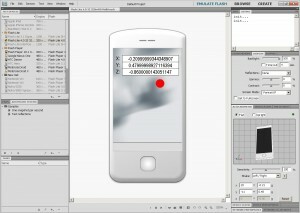 Create a file of type Flash Lite 4.0 in Flash CS5 or in Adobe Device Central CS5. Add three dynamic text fields in them will show the coordinates of x, y and z. Then check if the device has an accelerometer to add the listeners that handle the sensor data and update the positions of the ball.